Age – People between the ages of 16 to 20 years tend to have the highest occurrences of patellar dislocation due to a higher rate of aggressive sports participation. Gender – Women are more susceptible to these injuries because of how their hips distribute the body's weight. Genetics – These sorts of injuries tend to run in families due to physiological similarities. Some birth defects can also increase the likelihood of injury. In most patellar dislocation cases, people are able to slide the patella back into place with a simple leg extension resulting in a distinctive knee pop, but in some instances the injury is just too great. 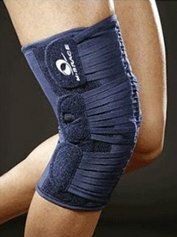 In these cases, many doctors will recommend a patellar stabilizer knee brace which should be worn for (at least) two to three weeks. These braces are often used in conjunction with professional physical rehabilitation. Many doctors also recommend taking a glucosamine supplement which is believed to keep ligaments strong. If instability continues beyond 8 to 12 weeks, speak with your doctor about more aggressive options, as in some rare instances, surgery may be the best option for patella ligament repair. About the Author: MMAR Medical Group Inc. is a supplier of orthopedic medical products, cold therapy devices, shoes for diabetics, and a wide knee braces including patella stabilizers, please visit MMAR Medical online.